Klein Sun Gallery is pleased to announce “Attacking the Boxer from Behind is Forbidden,” a solo exhibition by Li Liao that showcases a new site-specific performance, on view from October 14 through November 14, 2015. In Li’s multi-media and performance works, planned elements – a video, an instruction, or a routine – are usually catalyzed or interrupted by an action unscripted by the artist. In this way, Li inquisitively, and sometimes aggressively, plies the boundaries between auteur and subject, artist and observer, private and public. He is best known for the piece, Consumption (2012), where he utilized the self as vehicle for experimentation within the rigid construct of economic greed. He assembled an installation consisting of an iPad framed by the objects, leeched of character, that created it: a lab coat, a badge ID with a number and Li’s work contract. This piece was featured in The New Yorker and The New York Times. Whereas "Consumption" encapsulates a narrative of socio-economic conflict in a singular moment, Li Liao’s new work reverses that concept in initiating ephemeral bursts of conflict, confrontation and narrative. The new performance piece, "Attacking The Boxer From Behind is Forbidden (2015)," features a hired boxer crouched at the gallery from 12pm to 5pm, Tuesday to Saturday; as visitors enter the gallery, they unknowingly also enter a silent ‘boxing ring’ of tension, and the boxer’s volleyed gazes and defensive stances act as cues for participation and reaction. Interrupting the white walls of the commercial space, this performance complicates our sense of expectation. Contextualizing this piece are older works by Li which also touch upon the themes of probability and possibility. In the looping video, "A Slap in Wuhan (2010)," Li is seen waiting with his eyes closed for a visitor to arrive and the video only concludes after a stranger, hired through an online forum, turns up and physically assaults him as per instructions. In another corner of the gallery, "Single Bed (2011)," is screened in two short films. 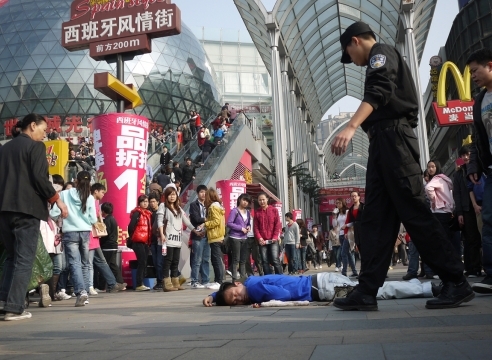 Here, Li lay down in public spaces in Wuhan, China, and drifted asleep, resulting in a seemingly innocuous and humorous capture of puzzled onlookers. However, the video piece is a subtle study of intervention and society’s reluctance to interfere. Finally, the exhibition space is dotted with 100 images that make up "Weight Loss Plan (2011)," a photographic chronicling of Li’s journey surviving on just 350 Renminbi a month – the same amount of money he used to spend a month ten years ago. Li Liao was born in 1982 in Hubei, China. He graduated from the Fine Arts Department of Hubei Academy of Fine Arts, Hubei, China, with a BA in 2005. His work has been the subject of notable museum exhibitions including: "2015 Triennial: Surround Audience," New Museum, New York, NY (2015); “Hugo Boss Asia Art,” Rockbund Art Museum, Shanghai, China (2013); "ON/OFF," Ullens Center for Contemporary Art, Beijing, China (2012) and "rites, thoughts, notes, sparks, swings, strikes. A hong kong spring," Para/Site, Hong Kong (2012).